Cozy and Neat place to livesubmitted by Krissy K. - May 01, 2018 |Recommended: YesThe property is always clean and well kept. Staff is great Always a pleasure seeing Ashley. My issues which haven't been alot were always handled professionally and promptly. Best place I've lived so far. 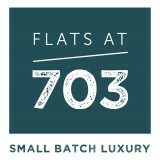 The Flats 703submitted by Meru M. - Mar 24, 2018 |Recommended: YesMostly good. Courteous professional staff. Soundproofing could be better from the outside. Elevators could be a bit faster. Pretty buildingsubmitted by Daniel H. - Feb 06, 2018 |Recommended: YesNice building. Small staff. quite. Brand new, modern building with nice amenities, close to many attractionssubmitted by Nathan S. - Jan 29, 2018 |Recommended: YesI have had a mostly very good experience with Flats at 703 so far. The only thing is that depending on where you are in the building, the noise from garbage trucks is loud in the early mornings. Other than that, everything is very nice and new. It is very close to many places in Towson and the club room, gym, rooftop lounge are all great.